JRPG house Square-Enix will be putting its cinematic department to work on the recently-acquired Eidos' upcoming Deus Ex 3. Gamers and the gaming press have been poking fun at the acquisition of UK-based Eidos Interactive by Japanese publisher Square-Enix for almost a year now, ever since Squeenix first expressed interest back in December. The merger seemed rife for parody, with Eidos' Western-style heroes like Lara Croft and JC Denton a far cry from Square-Enix's protagonists with a decidedly Japanese aesthetic. 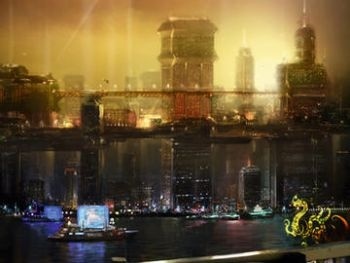 According to Eidos Montreal general manager Stephane D'Astous, the studio's upcoming sequel to Warren Spector's beloved cyberpunk FPS/RPG Deus Ex will be the first "concrete product of joint effort between Square Enix and Eidos" since the merger, with the JRPG giant putting its experienced cinematics department on the game's pre-rendered cutscenes. "The cinematics-by which I mean any CGI pre-rendered cinematics - are going to be done in Tokyo by Square Enix, and that's going to be amazing," said D'Astous. "It was in April when Square Enix acquired us, and by June, July I was trying to think of a project we could do together. One morning I woke up and I said, we'll, they're known for their cinematics, so why not get them involved with those?" Though neither company has said how many pre-rendered cutscenes the game will include, we know that - at the very least - Squeenix's movie-makers will be in charge of the game's introduction movie as well as the trailers. Beyond Deus Ex 3, though, D'Astous said that the Square-Enix cinematics department was thrilled at the chance to get to work on a non-Final Fantasy game, and had expressed interest in tackling the upcoming Thief 4 as well. While I'm sure that the news has some Deus Ex fans panicking over their suddenly-bishonen cyberpunk heroes, I'm not sure that there's all that much to worry about. It's hard to imagine that this means the cinematics will suddenly be designed by Square-Enix; the Tokyo-based studio will just be in charge of putting them together. In other words, it's unlikely that Tetsuya Nomura will suddenly show up and make the call that JC Denton needs to be wearing more belts and zippers. Though I guess it could still happen. If it did happen, my guess is it would be in revenge for Eidos' crappy PC port of Final Fantasy VII.